With over 25 years of dental implant experience, Dr. Radu can be trusted to give you excellent, lasting results with your dental implants. Video: What is a dental implant? Dental implants are the modern solution for replacing missing teeth. A dental implant is inserted into the jaw and acts as a tooth root. It is then capped with a durable restoration such as a porcelain crown, bridge or denture. Dr. Radu has been working with dental implants for over 25 years. He is a member of the International Congress of Oral Implantologists and lectures internationally to dentists and other professionals extensively on implant technology. When you get dental implant treatment with Dr. Radu, you won’t have to go to other locations along the way. Dr. Radu does the entire process right here in his office – diagnostics, planning, implant placement, restoration and maintenance. If you happen to need a sinus lift or bone graft as part of your treatment, we will gently take care of that in our office as well. Dr. Radu uses the latest in equipment and materials to plan your implant procedure. He checks your bone health and your bite and plans out the appropriate treatment for maximum durability of your final new restoration. He’s experienced and knowledgeable in different types of implants and uses the materials and techniques that are best for you. To make it as easy as possible to get implant treatment, we offer 3rd party financing options with payment plans as low as $100 per month. The payment options allow you to get the treatment you need on a fixed payment plan with no-interest and low-interest options. All your questions about dental implants will be answered in our Free Implant Consultation. 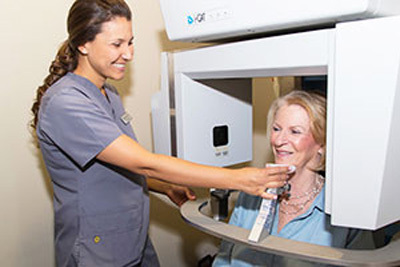 A CT scan is used as part of the planning for your dental implant. Once it’s been determined that implant technology is the correct path for you, Dr. Radu takes images of your mouth and jaw with his state-of-the-art cone beam CT scanner. This gives him a full 360° 3D image of your teeth and jaw area capturing all the information he needs to plan your dental implants. Dr. Radu examines your teeth and gums and takes any other images and impressions needed. He also checks your bite so that he can even out any misalignment, as part of your treatment. This promotes your oral health as well as the durability of your final restoration. From the images captured by the cone beam scanner, Dr. Radu uses 3D software to view and measure your bone depth, determine if any bone grafting is needed, and plot the exact type, placement and angle of your implants. A surgical guide is used to place the implants at the precise location and angle needed. 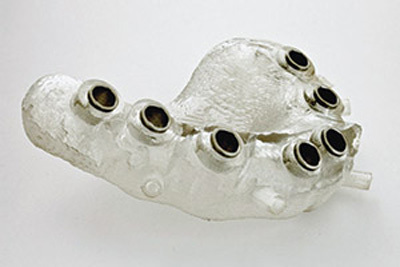 A surgical guide is created and positioned over the gums during the implant placement. This ensures the exact location and angle for the implant. He uses this technique because it significantly reduces complications to the nerves or sinus cavity that could slow down your progress. Whenever teeth must be removed, Dr. Radu is delicate and focused. He is careful to keep you comfortable throughout the process. The implant can then be immediately placed. Video: How bone grafting is done. Sometimes the bone area is not thick enough to support a dental implant or there is a situation where a sinus cavity is sitting too low and in the path of where the dental implant needs to be placed. In such cases, Dr. Radu will do a bone grafting or sinus lift procedure as part of the preparation. Bone and other organic material are gently introduced into the empty socket to enhance and enrich the area where the implant will be inserted. Dr. Radu uses a modern technique as part of the bone grafting which includes plasma rich in growth factors, designed to not only provide a healthy base for the implant, but to speed your healing time. Learn more about bone grafting and sinus lifts. You will be kept comfortable at all times during your implant surgery. Because Dr. Radu cares about keeping you comfortable, he’s developed a series of techniques that keep his numbing injections unnoticeable – his patients routinely tell him that they don’t even feel the injection! A variety of amenities are provided to make your visits pleasant, such as warm towels, soft dental chairs, music, movies and refreshments. Best of all, our reassuring and understanding doctor and staff are constantly attentive to your every need and concern. Once the implants have been placed, Dr. Radu provides an attractive and functional temporary restoration, whether a single crown, a bridge or a denture. This is so that you don’t go without teeth during your healing time and while your permanent restoration is being fabricated. Learn more about our options for missing teeth.